STATE SENATE | 10TH DISTRICT | They talked about pension reform, BART strikes, affirmative action and the environment. However, candidates for the 10th State Senate District rarely mentioned one of their opponents, Assemblymember Bob Wieckowski, nor did he speak up for himself, because he wasn’t there. Wieckowski’s campaign manager said the candidate stayed in Sacramento Wednesday to discuss one of his bills currently in committee. 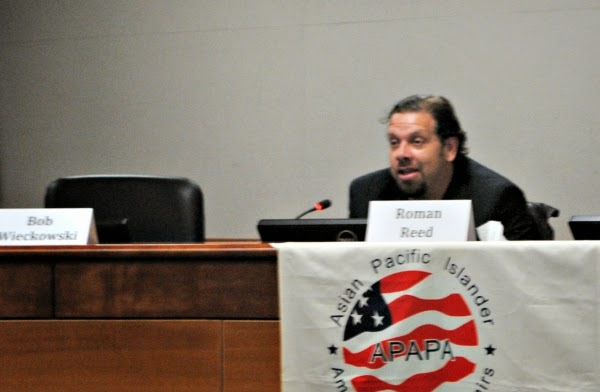 The Asian Pacific Islander American Public Affairs (APAPA) group which hosted the forum said Wieckowski notified them of his absence Wednesday just five hours before its start time. “Too bad Mr. Wieckowski wasn’t here,” Republican candidate Peter Kuo said in his closing statement. There was only one other mention of Wieckowski during the 90-minute forum as a placard printed with his name sat before an empty chair at the Fremont City Council chambers. 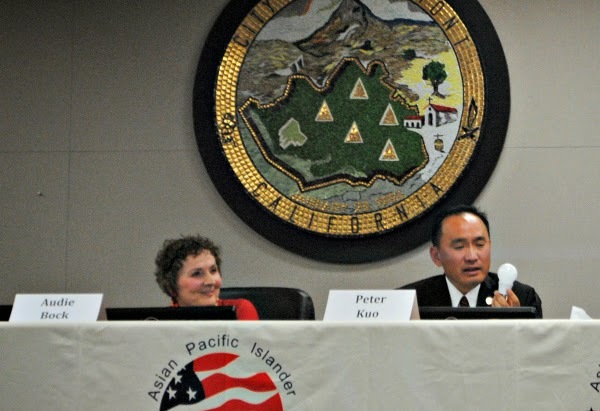 What Wieckowski missed was a fast-moving, concise and informative debate on the issues, featuring former Assemblymembers Mary Hayashi and Audie Bock, Fremont Planning Commissioner Roman Reed and first-time candidate Peter Kuo, who has recently captured the attention of the state’s Republican Party. In terms of the variety of candidates in this race, there is something for just about every chunk of the political spectrum: Hayashi and Wieckowski on the left; Reed and Bock in the center and Kuo right of center. No other issue Wednesday night emphasized the clarity of their ideological positions than the debate over Senate Constitutional Amendment-5 (SCA-5). The legislation is opposed by many in the senate district’s large Asian American community. The bill, which was passed by the State Senate in January, effectively rolls back Proposition 209, passed by voters in 1996 to prohibit the state from taken into account a person’s race when applying to state universities, public employment and government contracts. The bill was shelved last month in the Democratic leadership in the Assembly. at Chabot College said he supports education. “I would be 1,000 percent against it, if there is such a thing,” said Kuo, who has highlighted the issue to great effect with better-than-expected fundraising numbers and positive attention from within his party. “If you work hard and follow the rules, you will have the American Dream,” he said. Bock, now an independent, who served a term in the Assembly in 2000 as a member of the Green Party, derided SCA-5 as a violation of the Civil Rights Act of 1964. “We’re living in a new age of racism,” said Bock and added, “elaborations” on the law in subsequent years have allowed variations of racism to reemerge today. “There is no such thing as race to allow government to do anything,” said Bock. “SCA-5 is not the answer,” said Hayashi, although she fully supports affirmative action and credits it with helping women and minorities achieve greater success over the years. She added the issue is unnecessarily divisive. “Let’s work together with other minorities,” she urged. Environmental concerns were also common Wednesday night. On several occasions, Hayashi referred to the state’s looming water crisis and her support for rebuilding the Delta’s aging levies. Hayashi noted Gov. Jerry Brown’s tunnel project, but added its does not touch upon supply concerns brought on by the state’s on-going drought. “A major crisis is waiting to happen,” she said. 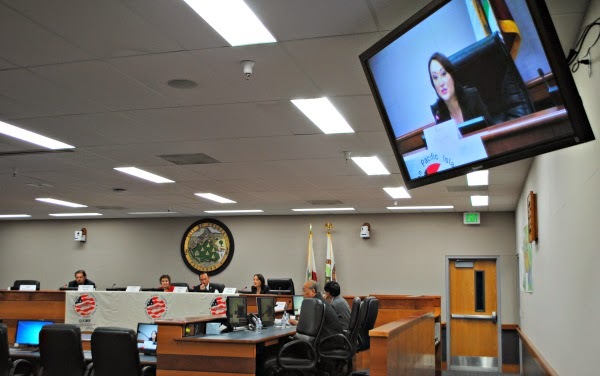 Kuo listed clean energy and clean water as one of his priorities, but it was again the controversial Calpine Russell City Energy Center in Hayward that elicited the most complaints. The 10th District includes areas in Alameda County and Santa Clara County from Castro Valley to San Jose. In February, the natural gas-fired power plant on the Hayward Shoreline, online since last August, was cited for releasing 10 times the allowable amount of water particulate into the air. Bock, long a critic, called it “wrongly-permitted” and a violation of presidential orders forbidding power plants in low-income minority communities. “We are the Environmental Protection Agency’s guinea pig,” Bock declared. Reed called for a moratorium on the plant recently given one year to remedy the source of the increased pollution, while Kuo called for Calpine to be held accountable for the pollution being created. Hayashi said local officials should take immediate action against the plant (the Hayward City Council issued a resolution on the matter last month). She also touted an Assembly bill she authored ultimately discouraging a second power plant from coming to the Hayward. In other local races, the discussion over banning BART employees the right to strikes is often a source of contentious. Not here. Kuo is the only candidate in favor, while the rest of the field faulted BART management for the sometimes chaotic pair of transit strikes last fall. Hayashi was critical of management allowing contract negotiations to fester until the last minute, while Reed called it the “nuclear option.” Bock agreed, but noted “there was a lot of bad behavior on both sides.” Bock, then inserted Wieckowski into the conversation, reminding the audience he was one of a short list of East Bay lawmakers thanked by union negotiators following news of the labor agreement. Posted in affirmative action, Asian Americans, Audie Bock, Bart strike, Bob Wieckowski, candidate forum, June primary, Mary Hayashi, Peter Kuo, Roman Reed, Russell City Energy Center, SCA5, State Senate, water. Bookmark the permalink. Were there any questions allowed from the audience? Or as in many forums did they only allow the public to submit questions on 3 x 5 cards that were then reviewed so that no uncomfortable questions were asked of any of the candidates? Too often they eliminate what the public really wants to ask. Perhaps this forum was different? Who put the debate on? Who sponsored it?